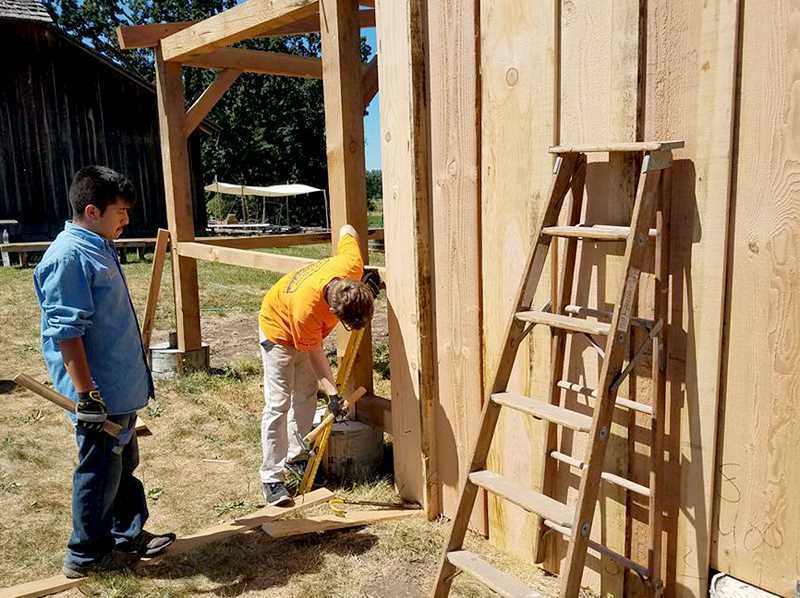 After two busy years, Anvil Academy has finished building a mid-1800s replica blacksmith shop at the Champoeg State Heritage Area. The students who helped construct the shop celebrated the event Aug. 18 at with a program depicting 19th century farm life. The event showcased the skills and crafts of that time period with woodworkers demonstrating pole splitting, sawing, squaring logs into beams and constructing structures like a threshing barn. "The event was great!" said Rob Lewis, owner of Anvil Academy. "I had three kids show up and there wasn't a lot of public, but it was a good crowd. We took a bunch of wheelwright tools, spokes and raw wheels and the kids demonstrated how a wagon wheel is made." Lewis said he was a bit concerned that a burn ban and heavy smoke from fires would drive away students and visitors from the event. "The event displays traditional trades and we usually go over and band a wagon wheel -- that requires fire," Lewis said. "We also do blacksmithing demonstrations, but that requires fire (as well). This time the event (was) different because of the fire ban." Lewis teaches high school-age kids after school and was looking for a project they could do to benefit the community and one where the kids felt like they had ownership. He approached luminaries at Champoeg to see if there was anything they needed and Dan Klug, an interpretative park ranger, told Lewis that they needed a blacksmith shop. The project took off from there, with Lewis organizing, applying to the state for approval and finding materials. "It's got benches, an anvil and forges," Lewis said. The barn is framed with timbers from a lumber company near Philomath, Hallow Oaks, who is a supportive partner of Anvil. The barn holds two forges, with enough room for two blacksmiths to work inside. 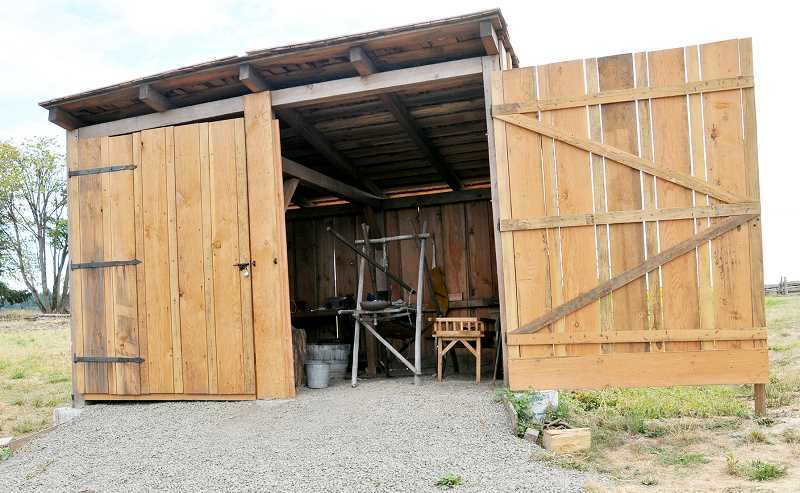 An entire side of the structure opens and large doors that swing out are heavy with blacksmith tools hanging from nails. Twenty students participated in the project, 10 regularly, and one made it his Eagle Scout project. "The building is not exactly square because it was their first time doing it," Lewis said. "It was all done pretty much by hand and we used a drill press for some of it and we had to buy special mortising chisels to get the mortises in and a chisel, a hammer and handsaws. We did something three hours in the afternoon, maybe two or three days a week, and it was a lot of stop/start." The nails, hinges and some of the tools were made by hand in a process taught by Jeff Cawley, who visited the academy on Thursdays. Cawley worked as a volunteer at Fort Vancouver for more than 25 years. "I was helping with the basic metal skills, took the kids through basic smithing skills, heating up the metals and draw tapers. Once you learn the basics you can combine them and make a useful object," Cawley said. "I had the kids make the tools that they were needing -- the punches and so forth. If you look on the hinges on those doors the holes are hand punched … which was the way it was done back then." The crew forged around 150 nails to construct the building. "If you have everything going right, it doesn't take long," Cawley said. "In the old days a really good nailer, who had things well set up, could do a 1,000 nails a day. Of course, the kids were not quite at that status, neither am I. These are pretty big nails because you're going through a couple layers of boards for the steel for the hinge and need enough on the end to bend over and clinch, because it was the way that they did a lot of fastening back then. Mass produced screws for example were not available." Daniel Klug, interpretive park ranger and host coordinator at Champoeg State Heritage Area, said the park holds demonstrations by tin smiths, wagon builders and mules plowing the wheat field with farm equipment. "Without the blacksmith none of these other skills and crafts would exist," Klug said. "The blacksmith made tools for all the other craftsmen as well as the farmer and the homestead."